I was in Philadelphia a couple of weeks ago and I got a chance to check out NextFab. I was really impressed with their setup to say the least. It was a 20,000 square-foot warehouse that had been renovated. It contained a cafeteria (under construction) as well as offices, woodworking shop, welding shop, electronics shop, a paint booth, a camera studio, and an assortment of 3D printers. The first thing to know is that this is a for profit makerspace. Their business model revolves around many different sources of income including paying members, corporate memberships, government memberships, renting conference rooms for presentations, renting classrooms for teaching, and business incubation. They have about 300 paying members. When I asked about the popularity of the different shops he said that the woodworking shop was the most popular. The people working in the wood shop consisted of mostly hobbyists, but some were people who built furniture or custom woodwork who needed extra capacity or space to complete a specific job. While I was there the busiest area was the electronics shop and product design. Lots of projects and various forms of completion. One thing my tour guide warned about was space. While he liked having a camera studio, it went unused quite a bit. When they needed it, it was really useful, but otherwise it was wasted space that could have been used for something else. He also said that they would take large deliveries and store them for a fee. This allowed people to have their materials delivered to the shop instead of their house. As he explained all of this, I began to realize that their ability to monetize space was very important. Nextfab also offers their conference rooms for rent. I wish I had a picture, but it was really professional. People who needed to present to venture capitalists, or give any kind of presentation can rent the room, which had a long conference room table and a projector mounted to the roof. He also said that they would host corporate team building exercises as well. 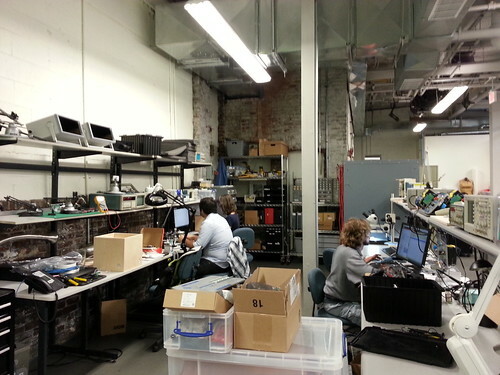 In addition, they host a business incubator. 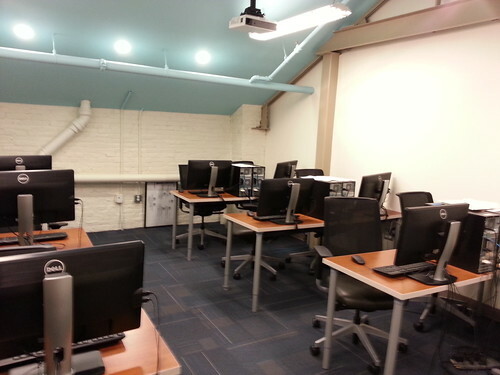 For a fee, a person can rent a small office and have access to the resources of the makerspace and 24/7 access. They were hosting about 3-4 businesses while I was there. My tour guide also said that several smaller firms and some government agencies had memberships. 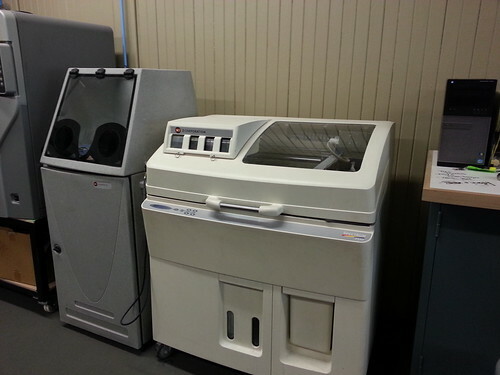 Mostly to get access to the massive 3D printers onsite for prototyping and design. This included a Z-Corp full color 3D printer! All told, they had about 10 different 3D printers onsite. All together it was a great visit and I really learned a lot. You can view the full gallery of my visit HERE. Well, it has been one epic month for the Mobile Makerspace. Our Google Plus membership stands at 92 members as of this morning. This is great news and shows how interested the people of Mobile are in our group. This has also been reflected in our physical meetings. Each time we meet we have more and more people and its great to see new faces each time. We have also attended several events this month including the LoDa Artwalk and Jagfest. We met a lot of great people who showed a lot of interest in what we are doing. One thing we did differently at this artwalk than in the past, was we had the kids make the LED throwies instead of just passing them out. I think they liked that better and it is more in line with our desire to teach people about science and technology. 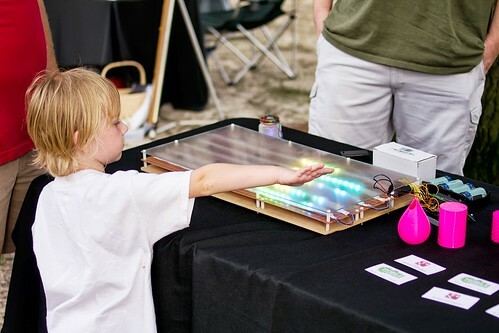 Dana Spisak’s LED sensor board drew a lot of attention and kids couldn’t resist playing with it. Brent Quigley brought by some prints from his Ultimaker 3D printer to display. The quality this printer produces consistently impresses me. Thank you to everyone that came down and participated! Jagfest was also a huge success and we got a lot of people to sign up for updates and notifications. We had a lot of computer science and engineering students drop by the table. Most of our senior leadership are all University of South Alabama alumni, so we hope to work more closely with the university in the future. Last, but certainly not least, we completed our first workshop! 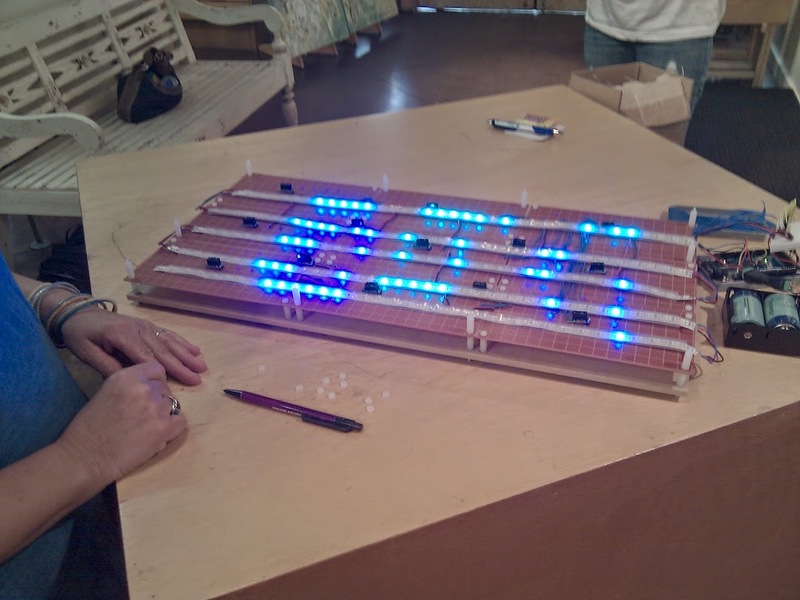 We had over 20 people attend our Arduino Bootstrap Workshop this Saturday @ Ashland Gallery. Since it was our first workshop, it was a little crazy and we learned a lot, but I think everyone had a lot of fun. We finished a little early (We will plan for more content next time!) and some people began to show off some of their creations. Dana impressed everyone with his drawing machine. It was based on an Arduino Mega with a motor shield. It was a perfect compliment to the workshop since it showed everyone what can be done once you begin to create more complex projects. Some other participants had a foam cutter that they demonstrated. Its really exciting to see all of these talented people getting together to meet and exchange ideas. I had a lot of great conversations and I feel really good about the direction the group is going. At the end of the workshop Dana provided some door prizes and we raffled off some 3D printed objects, a coffee cup, and some prints from the drawing board. Stay tuned we will have updated meeting and events scheduled soon! First I would like to thank Ashland Gallery for hosting us this weekend! It was a great meeting and a lot of fun. Patrick Davis had his drone setup and demonstrated the wireless telemetry feature. He and several other members discussed a project to fly an unmanned drone over Mobile Bay, so stay tuned for updates! Rick Green brought several boards and discussed the applications of each with new members. One board of interest was the Beagle Bone Black. This little board packs a huge punch and is great for applications where processing power is paramount. He also spoke about the Raspberry Pi and the Arduino. That’s right, we are planning a workshop on August 24th from 2pm – 4pm. 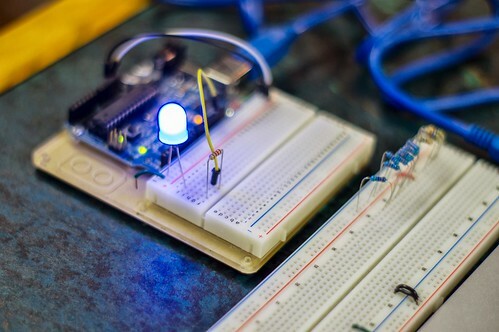 This will focus on getting you familiar with the Arduino board and the programming environment. No prior knowledge with electronics or programming will be necessary. We will keep you posted with more information as it becomes available. If you, or someone you know is interested, let us know! We are official! Rick Green has been hard at work getting all of the paperwork filled out to become incorporated and to register as a non-profit organization. Earlier this week he took to Google+ to let us all know this has been completed! BBQ! Somehow Rick also found time to compete and place 4th in the “Big Flame BBQ” competition last weekend. Pretty Lights! Dana Spisak has been hard at work on a project for next weeks Artwalk event. If anyone else is working on anything and wants us to post it send Patrick Davis some pictures and a description. Banner has arrived! Johnathan R. did a great job on designing the logo for the organization. Today he let us know that we will have an official banner for our table at Artwalk. He will also have the banner at the meeting this Saturday so we can check it out. We have a general meeting this Saturday @ the Ashland Gallery. This meeting is open to the public, so if you are interested in the group please feel free to stop by and say hello. We will also be setting up a table for Artwalk on the 9th in Cathedral Square. Drop by and check out some projects! First LoDa Artwalk a success! We now have a Twitter and Flikr account for the Mobile Makerspace! This will allow us to get information out to our members and gives us a place to share our photos. We have a new survey on the homepage. This will help us collect data about our users and make sure that we are aware of their needs, so please participate if you get a chance! Several of us are meeting at Wintzell’s Oyster House on Dauphin Street this evening @ 6:30. We are gonna get together and talk over a meal with +Marshall Smith about experiences making software, hardware and other solutions in his new company in Colorado.